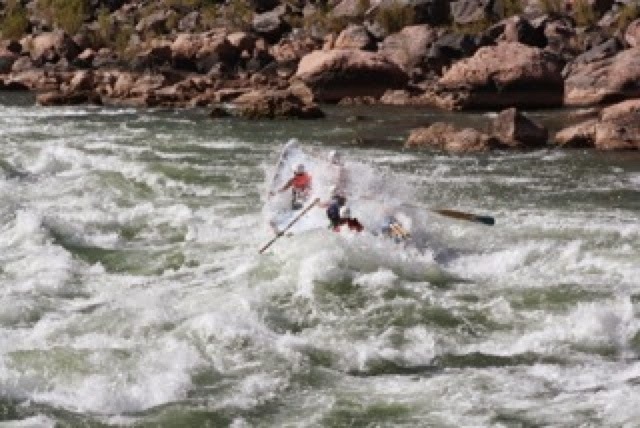 THE ONE | DBP MAGAZINE ONLINE The World's Best Free Whitewater Publication. “That raft!…It’s touching my boat!”, Ote exclaimed. The word raft was delivered with definite disdain. It sounded as though her remark was directed at me. My raft was tied next to her dory. There was not a sound but the trickling of water moving beneath us. Then “squeeerinch,” the sound of Hypalon rubber against Gel-coat, I heard it that time, my craft touching hers. I brought my hand up from deep in my sleeping bag and pressed the button on my watch to illuminate the time. It was 2:10 in the morning. No-one and nothing else moved. I better do something; she is the Trip Leader. 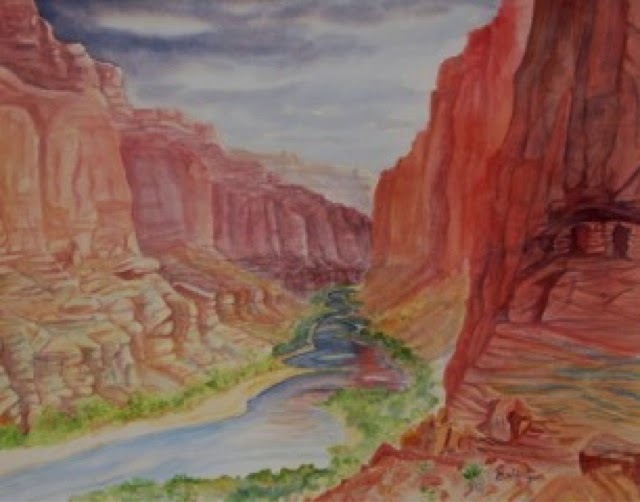 We were in the shadow of the south wall of the Canyon, but the bright moon lit the wall to the north reflecting a grayish glow on everything in sight.I slipped out of my bag and stood on the deck of the oar frame. From what I could see this would take less time than it would take to get dressed and undressed again. If she wanted to see it done, she could see it done by a naked man. Stepping off and on to the hard sand I avoided my own bow line which was still somewhat straight and snug. All the boats were canted upstream in the direction of Ote’s, which was last in line. Quickly stepping and hopping over each bow-line I went to the downstream stern line anchor. It was slack and laying on the water. The rope was tied off with a taut-line hitch. I didn’t know if the tide had come up or the knot had slipped, so I untied it and replaced it with a trucker’s hitch. Using the loop in the knot as a pulley i drew all the boats to where they were parallel again. Sure that the downstream dory would not touch a nearby rock I went back to where I had started, dipped my feet in the water to rinse off the sand and stepped back on to the deck of the oar frame.With my hands on my hips standing in the grey light, I looked up and then down the line of crafts to be sure all were secure. I listened to the soft gurgle of the river, no more “squeerinch”, the job was done. Several days later, we arrived at Elves Chasm. It’s a “must” stop on any Canyon trip. It was already determined that the parking area would be filled with dories and guests. So, the baggage rafts pulled to shore above the mouth of the creek. After tying up we climbed up and over a spine of rock then descended along the wall to join the others on a patio-like shelf of rock. The boatmen were having a discussion and making plans for a hike from that point. Now, if you wanted to, you could shuffle a group of folks up to the last plunge and pool the creek makes before going on it’s way down to the river. Even with a few hearties, willing to make the swim across the pool, climb up, behind and above, to jump back into the pool, the visit could easily be done in less than an hour. We would be gone for a good bit longer; snacks and water would be needed. We were informed there would be a number of places where we would be exposed and heights ,climbing and falling hazards would be part of the trip. We were to stay together as a group and to assist each other where needed. We were also told to follow the directions of the boatmen along the way. This last part was important, even the simplest guidance made things go quickly; “left foot first; right hand here.” There was no lack of places where your day could go bad quickly, a small miss-step, loss of a grip or lack of commitment could be painful for all. I’m always willing to take things to the next level. In this case we were going to take it to the Seventh Level of Elves Chasm. Our destination had an air of mystique, a labyrinth of a route up and through a narrow slot in the canyon. With all the planning and attention to detail I was quickly convinced I would never make my way on my own even if I know the place existed, without the help of the boatmen. Each level ended with a small waterfall or a blockage of boulders requiring a climb that had to be passed. Over, around and even up and through the stones. Each level attained heightened the anticipation for the next and ultimate. There would surly be something special at the end. Before we had reached the Seventh Level Ote had let it be known that once we were all together at the top there would be 17 minutes of silence.It wasn’t delivered as a demand or a request, just sort of matter of fact. Not 20 minutes, not 15, but 17 minutes. No one asked questions; we had paid the ticket by getting this far. This small ritual seemed worth the price. Each level came with it’s own set of keys; little puzzles to be unlocked; tip-toe along a ledge; climb over these rocks; slither along on your side under this overhanging slab. This last climbing move was no different. I might have found my way past all the other obstacles, it just would have taken a lot of time. This one would have stumped me though. 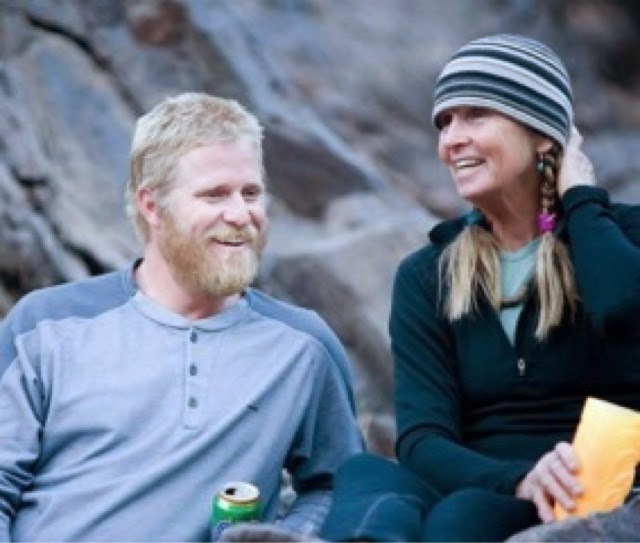 “Reach up at about 10:00, on the backside of the slab of rock in front of you; the hold is about the size of a half a tennis ball; if you miss it just hop back down and start again; don’t fall.”One short lunge and the hold was right in my left palm. Without someone to tell me I never would have found it on my own. On top we found ourselves in a large alcove or small amphitheater. Vertical walls all around us signaled the end of our hike. There was nowhere to go at this point but back the way we had come. Everyone was quiet. There was plenty of room to spread out. Some drank water and had a snack, others turned over and looked behind rocks, some took a few pictures. Most, like myself, sat and got comfortable with the peace. Call it at-one-ness, atonement, to be a part of it all and apart from it at the same time. So rare do we get to hear the wind passing through cottonwood leaves, drops of water splatting on a flat rock or the call of a Canyon Wren. There was time to soak it up; this was just the treasure I hoped to find. Though there were a number of us there together each us had a chance to be alone in thought for 17 minutes, far from home. Back again the following year I was pleased to find Ote working the same trip. This would be Monsoon season, late summer, and there would be rewards; not just torrential rain and wind alternating with sweltering heat. I saw three double rainbows and thundering cascades leaping over the walls from storm cells seen and unseen. Late summer also means peak electrical demand and therefore consistently higher water than I had seen on trips past. In a few places in the canyon where you were and what you did on the water can add up to a pretty good accounting of the water level. Duebendorf, Hance, Crystal, and Horn Creek are good examples. Lava Falls is one of the best illustrations of this. If your trip leader lands river left well above Prospect Canyon to scout you won’t be running the right side. The route left of the Ledge Hole doesn’t open up til above 18,000 cfs, and right of the hole is considered off limits above 20,000 cfs. It seemed pretty clear to me why you wouldn’t want to enter right. Even running left, the whole river seemed like it wanted to be a part of that huge hole and was pushing against itself to get there. We studied the run for a good long time before the boatmen filed away by twos and threes to run in tight order for coverage. Ote and I watched carefully, lost in our own thoughts. We would be the last two boats. It’s true that what you see from above is not as obvious from the water. You hope that you picked out some features that were easy to key off of once you get out there on the water. The first landmark was a rock sticking up out of the water about 12-15 ft. off shore. As she made her way between the rock and shore I called out to her, “how much space do you want?” “About 50 ft.,” she said. I guess this is easy to imagine from the corkpit of a dory; every inch of it’s hull as slick as a sheet of ice. She could change her angle with a deft pull on one oar; poise herself in position with a gentle tug on both, stilling the boat long enough to stand and plot her route down the tongue. Every wrinkle, seam and drain hole on the raft was being drug down stream by the current. It took some effort to maintain my distance and weigh that against my desire to harness the strength of the river and gain the momentum to leave the left shoulder of the tongue, avoiding the big stuff out in the middle. There were two clocks ticking in my head. One was a warning clock; there to remind me not to get too close and effect her run. The other was telling me I needed to push in order to stay on the plan I had devised on shore. Both clocks stopped at the same time Ote began to accelerate into the rapid. I knew at that moment I needed to modify my run. She was headed for a huge hit, where the apex of the tongue folded underneath the tail-out of the backwash from the Ledge Hole to her right. That collision would surly stall her boat and I would end up too close. I began pushing straight toward a hole to the left. Originally I only wanted that hole as a marker and would come underneath it as I left the force of the tongue. The plan was simple and quick; the impact with the hole would take my speed leaving nothing to work with but boat control to deal with everything after that. It was a calculated risk designed to separating our runs. In the hard heartbeat that it took to push into and through the hole I could see the “Dark Canyon” meeting the maelstrom from the corner of my eye. 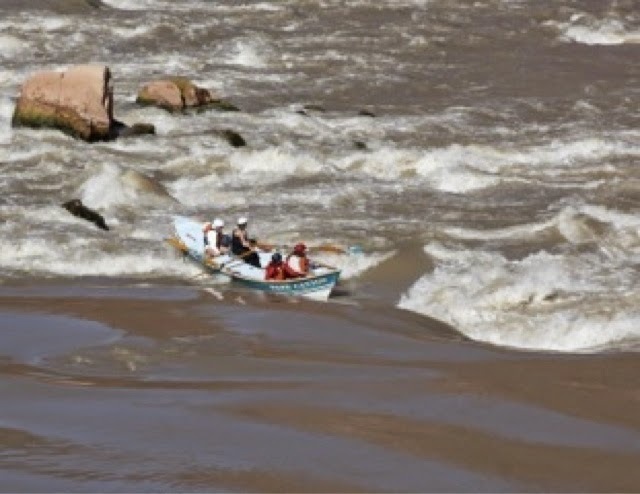 White wrapped around her boat and as it started to pitch upward and rise it also rolled upstream. I had my own set of concerns; where dories slice, rafts must punch bluntly. Keeping both oars in the water while I cleared the hole, I then reset my angle and gave a stiff pull to avoid some boulders and shallow pour-overs straight ahead. This action set my raft into a ferry; the current pushing against the oblique angle of the tube slid me toward the middle of the river. I missed the big hit that she took, but found myself within 10 feet of her upside-down boat. 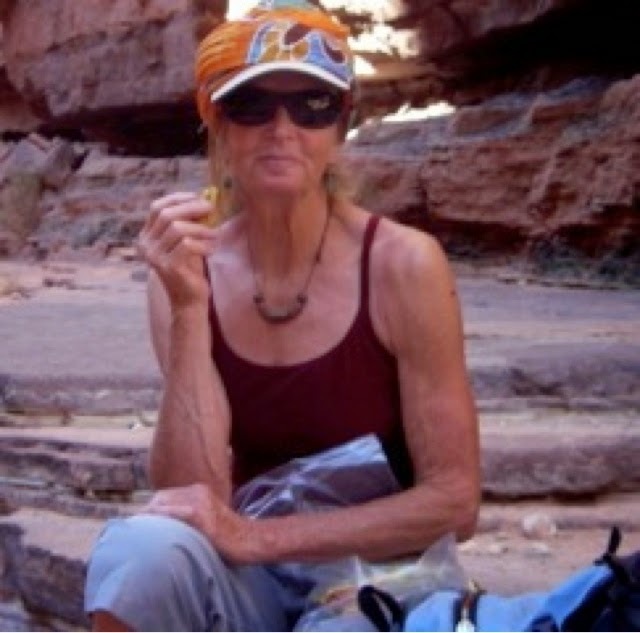 When Ote appeared at the surface, her left hand snatched her floppy straw hat back to uncover her eyes as her right hand reached out to to grab the belly band rigged across the hull of the boat. I thought of a water spider as both arms and legs moved by design to get on top. Leaning over she reached for the cam buckle to release the tension on the strap. Laying back while perched on the gunnel along the edge of the boat she gave her hand to a passenger whose added weight was enough to slowly roll the boat upright. She seemed to vault back into the boat like an agile cat and immediately set to pulling her people back in. I continued to pull on the oars in order to avoid so much as touching her boat with my raft. I kept one eye on my throw rope but was sure I wouldn’t need it. Inside I was screaming, “Go, Ote, go!” over and over. I so much wanted to help, but, she had it all. As she pulled her last guest in, it was obvious that we would come in contact. If it couldn’t be avoided, it was best to make the most of it. A right pivot would bring the broad soft portion of my right quarter in contact with her bow. 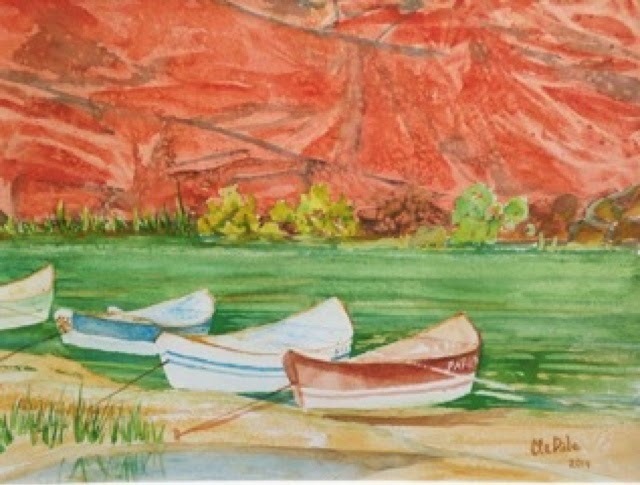 One gentle nudge was all it took to change the angle of of her boat so that her momentum carried her across the eddy-line as she regained the cockpit and collected her oars. The nudge was probably imperceptible. The opportunity was there. I couldn’t resist the urge to help her, her people and her boat. I’m sure I didn’t leave a mark. It was also a little self serving; I wanted to change my angle so I could get into the same eddy. Given the water level, it was pretty spectacular that we came to rest at the foot of the springs that emanate from the mouth of Prospector Canyon where the warm water meets the river. In the course of the run we were all separate but together; one with the river. Every once in a while Ote would take an ammo box from her dory and disappear, after supper was finished, the kitchen cleaned up and put in order. No…it wasn’t what you’re thinking. One of the boatmen explained it to me. She would slip away with the trip’s Sat-phone, with an extra battery especially for her purpose. The primary battery would never be used, as the phone was there specifically for emergency use should the need arise. I was told she used the phone to talk to her husband, Regan. I don’t think she was ever gone for more than 17 minutes, or that she would ever put our means of communication in jeopardy. One night I passed close by, looking for my own place for solitude. I didn’t eaves-drop, nor could I hear the words. But, the tone of the conversation was clear. It sounded as if the she were down at the corner market and just checking in before heading to the house. Of all the distinct impressions Ote made on me, this was the sweetest of all. It illustrated, not necessarily love and devotion, but an attachment; a oneness with another person. I was just a lowly volunteer baggage boatman, unpaid. 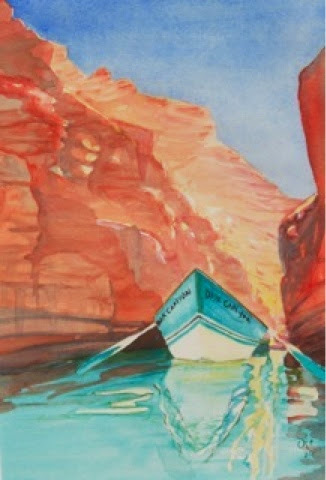 But, what an honor to run with a Grand Canyon Dories trip. You can’t put a price tag on that. I did work hard to make a good impression, though I was told that I worked more than was expected for someone in my position. I brushed it off by saying, “I’m part of the trip, I know the things that need to be done, and by doing that I feel more like a part of the trip.” Bruce just put up his hands in surrender and said, “carry on,” and walked away. 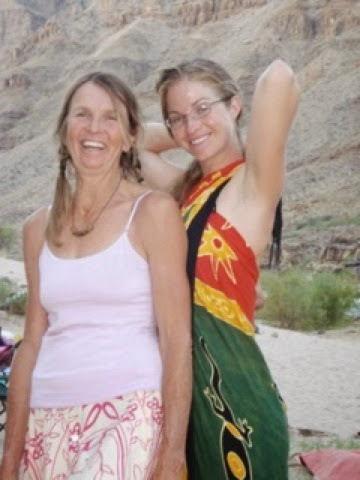 Half truth, I made it kind of a game: to avoid being playfully admonished by Ote, as she did from time to with others, saying, “you’ll never see whitewater again!” She also made me laugh with her rhetorical question, “What to Hell?” And, she never asked of me. To this day, I don’t think she knew what a deep and lasting impression she made on me. She didn’t do so with knowledge or intention. She was simply being herself. By being the one, Ote Dale. 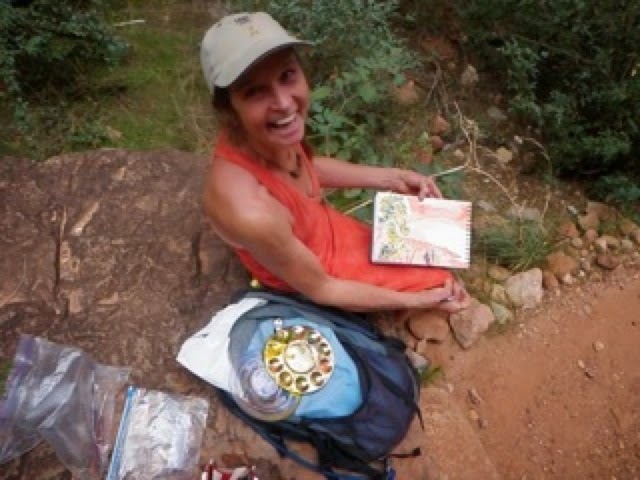 Ote Dale currently resides in Kanab, Utah, where she practices her water-color art and yoga instruction while taking a break from the river. When I first sat down to write this, I wanted to let her know that I was going to do so first. A mutual friend gave me a way to contact her. (Small world, made even smaller by Dirt Bag Paddlers.) Of course I didn’t need her permission as I was writing from my own memories, but I respect a person’s privacy. She was very gracious and provided the pictures that appear with the article. 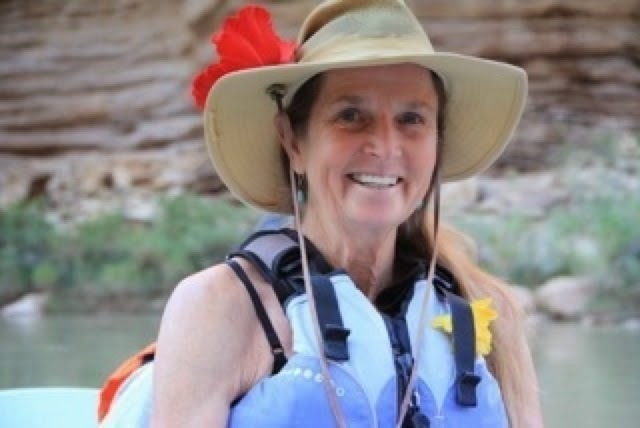 She was also very humble: “I don’t know how my meager career as a river guide can help you.” Some people in my life have made meager contributions to the person I want to be. Even meager contributions can have a profound effect. After I finished this, I sent her a copy. She approved and now I am the one who is humbled. I think it may also have jarred her memory of me and that fateful day at Lava. 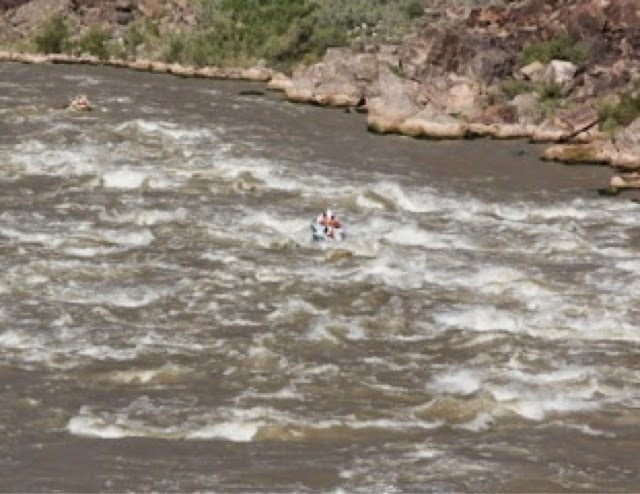 That may have been the last time she had flipped on the Colorado, before 2014. She related the story to me. Running without passengers due to the low flow, Hance and the wind ganged up on her. After 40 years, she has decided to hang up the oars (at least commercially). I have no doubt the river has not seen the last of her. Kids, that’s a pretty impressive record in my book. So with that, I hearby dub her a True Q (A Dirt Bag Queen of the highest order). Thank you, Ote, you are the One. WHEN DID “UNION” BECOME A DIRTY WORD? The writings of Taz Riggs. Online Magazin Geht es im Geschäftsleben darum, eine Marke noch bekannter zu machen oder eine Kundenbindung zu vertiefen, dann müssen verschiedene Marketing Strategien zur Anwendung kommen, um eine möglichst große Zielgruppe zu erreichen. Eine Form, die bei der Entwicklung der Marketing Strategie keineswegs vergessen werden sollte ist das E-Mail Marketing.